toyota corolla 1980 (4k Engine ,1290cc) Carburetor Main Jet Size? Every One.... 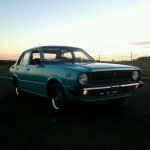 I am in a problem with my Toyota Corolla 1980 (4k Engine ,1290cc) that it consumes alot of fuel. its about 9 to 10 km / liter . Can any expert tell me about the original carburetor Main jets size that company fits. It's worth checking ignition timing, points gap, spark plug gap as well as checking for vacuum leaks, as any of these things could affect your economy! What is single carb. or Twin Carb.? I do not have point distributor . i have plus distributor with CDI.